When a mass shooting claimed the lives of 58 people in Las Vegas last fall, the national conversation turned once again to guns. But despite the usual flurry of internet arguments and talking heads, no concrete change occurred. Things may be different this time. 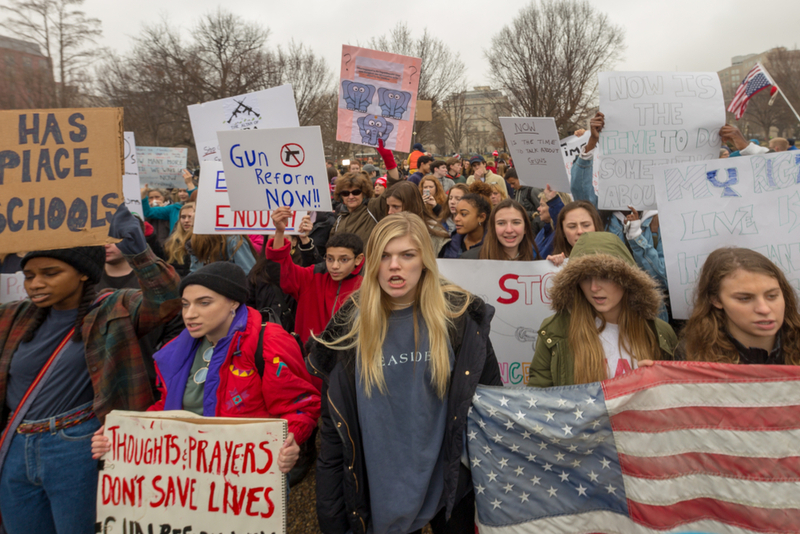 During the week since the tragedy at Florida’s Marjory Stoneman Douglas High School, a student-led protest movement has dominated headlines and acted as a potent focal point for gun reform advocates nationwide. Founded by survivors of the Stoneman Douglas shooting, the student organization Never Again MSD will lead a “March for Our Lives” in Washington, D.C., on March 24, demanding that lawmakers prioritize gun violence prevention. At the time of writing, the group has amassed over 120,000 followers on Facebook, over 100,000 on Twitter, and more than 50,000 on Instagram. Satellite marches are expected to occur in cities across the country. Several school walkouts are also in the works. The grassroots energy around Never Again has already spurred an outpouring of donor support. Some of the largest sums so far come from Hollywood personalities like George and Amal Clooney, Oprah Winfrey, Steven Spielberg and producer Jeffrey Katzenberg. The Clooneys led the way with a $500,000 donation to support the upcoming march, which the other entertainment luminaries have each pledged to match. On Twitter, Winfrey compared the March for Our Lives to the civil rights movement’s Freedom Riders. A chorus of other A-listers have also voiced their support. The Clooneys are hardly strangers to philanthropy. But this is the first time they’ve addressed the gun issue in a major way. The actor is known for his work against genocide in Sudan, especially through the organization Not On Our Watch. In 2016, the couple founded the Clooney Foundation for Justice. The foundation’s work has centered on addressing the Syrian refugee crisis, combating hate, and pushing for fair judiciaries in other countries. The couple’s $500,000 contribution to March for Our Lives doesn't come from the foundation. For the Never Again movement, celebrity support goes hand-in-hand with an outpouring of smaller donations. In just four days, the March for Our Lives GoFundMe page has raised over $1.8 million, mostly from donors pledging in the $25 to $50 range. As we’ve written before, crowdfunding tends to favor causes that get a lot of news attention and pull in support from notable figures. It’s also a way for people to register where they stand, and this issue is more divisive than most. That divisiveness, and the sense that national progress on gun reform is forever stalled, has held back philanthropic giving. Despite around 35,000 fatalities in the U.S. every year, gun safety has not been a priority for the sector—a few dedicated funders excepted. But that may be changing. For one thing, Michael Bloomberg's Everytown for Gun Safety has been busy building a 501(c)4 infrastructure to influence Congressional races, while its 501(c)3 arm pursues policy research. With federal research on gun violence sparse to nonexistent, getting the hard facts is one focus of longtime funders in this space. On Friday, Everytown received a $1 million gift pledge from Eli Broad, a philanthropist who has previously given for gun issues. As with other donors stepping forward right now, Broad is angry and frustrated by a tragic problem that just seems to be getting worse. “No one should have to endure what the students and families of Parkland suffered last week, or what too many Americans suffer daily from our country’s gun violence epidemic. This must stop," he said in a statement. Brotherton has encountered a “tremendous” level of energy in the wake of the shooting. He says that Kendeda plans to make new investments in short order, and points to a surge of interest from donors, including newcomers to the issue. With a lot of money coming into philanthropy right now, it wouldn't be surprising to see more major donors swing behind gun violence prevention. Many donors prefer to focus on issues where progress seems possible and the perception of improving the odds for real wins on gun violence could catalyze new giving. If any mega-gifts do come down the pike, some of the credit must go to the student organizers who have refused to let the nation’s attention stray from the latest massacre. It’s still too early to tell if the movement will lead to any meaningful legislative reforms, but this moment has been a real-time demonstration of how funding often follows movement building, and not the other way around. Philanthropy can bankroll research and policy expertise, building critical infrastructure to move an issue. But it's grassroots organizing that often creates political will and pries open a window of opportunity for action. Based in California, and backed by a number of foundations in that state, the Hope and Heal Fund focuses on community-based strategies to prevent gun violence, which claims far more victims from street crime and suicides than from mass shootings. Malte previously served as national legislative director of the Brady Campaign to Prevent Gun Violence. He turned from changing laws to changing communities as a more immediately workable strategy. There's much that can be done to lower the body count from guns that doesn't requiring overcoming the NRA's might. Specific methods here include working with diverse stakeholders to back interventions that target gun violence in high-crime communities, treating such violence as a public health issue (including by addressing gun suicides), and better enforcing existing laws, such as those that restrict access to guns by perpetrators of domestic abuse. In Chicago, we’ve seen funders like MacArthur, Kellogg, and Google.org embrace that approach. They’re partnering with local nonprofits to get a handle on the incessant violence that’s wracked parts of the city. This same kind of approach is spreading to other cities with the help of groups like the Peacemaker Partnership and the Community Justice Reform Coalition. Even before the Parkland shooting and the new student organizating, there was a growing sense of hope around the gun issue. But a lot of this momentum has come from a better appreciation of what can be achieved without legislative wins by working with those communities most affected by gun violence. Now more than ever, philanthropy is in a good position to help connect up diverse efforts to reduce the carnage caused by guns.